We start with a montage of Will and Hannibal, each dressing for the morning; The whole scene is a lovely aubade to their relationship. 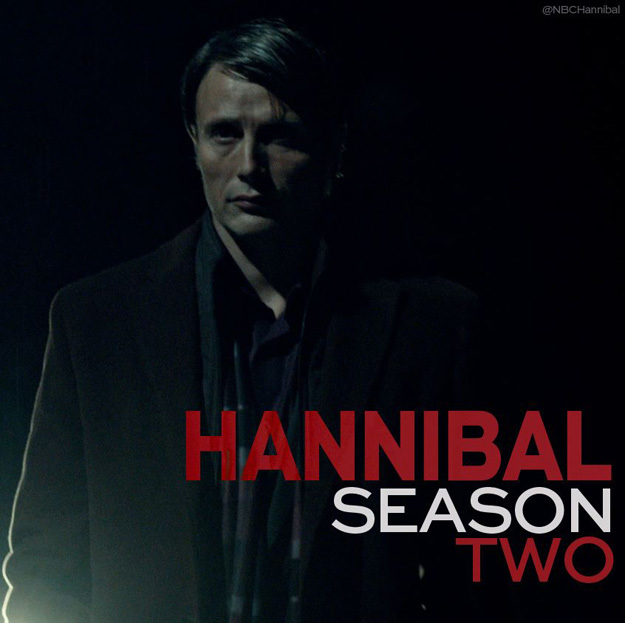 Hannibal has placed himself into Will’s life violently, but why? This seems to be the central question of this season: What exactly does Hannibal want from Will? If it’s just a kindred spirit, then he and Will could certainly bro it up in a number of narrative ways. I think he wants Will to best him, because he believes Will is the better man. Again, this is all speculation, the darkness set against the relief that accentuates the more disjointed parts of the episode. As to that, we are reminded, for whatever reason, that Jack’s wife is dying of cancer, something he (and I) seemed to have forgotten. This felt like a weak and poorly timed attempt to garner some more sympathy in Jack’s corner, when really we should be feeling for Will. Then, the reporter reemerges to give totally boring testimony. It’s like, Oh right, we forgot about all of these ancillary plots and characters, so why don’t we just throw them all in the mix? Throughout, Will’s lawyer makes the worst jokes. Honestly, the only standout things about this episode were Cynthia Nixon, who plays an internal investigator for the FBI, and the judge’s gruesome murder. Against the obviousness of the trial, the episode only peers slightly further into whatever the hell is going on with Will and Hannibal. His fevered dream sequence of possible escape is squelched by Lecter, which only mirrors the let-down of Hannibal as a courtroom witness. We see, in the barest and darkest terms possible, their relationship changing, though this early in the season it feels glacial. I hope in the next episode their relationship is brought more to the forefront of the relief structure. I do wish we’d seen whatever it is that happened to the judge’s brain. Call me morbid, but the whole courtroom aspect left me wishing for a more gory palate cleanser. Also, what in God’s name kind of outfit is Hannibal wearing here? My predictions for this week’s episode: We know Dr. Katz is going to take a central role, but I predict her doubt of Will falls away like scales from her eyes. Dr. Bedelia (Gillian Anderson) appears to Will in a vision/dream/hallucination. Cynthia Nixon will wear another power suit. Jack’s wife will die sooner than his in-the-works trip to Italy. Hannibal airs Friday nights on NBC. You can read our piece about the previous episode here.